Available Free for July. Contact me. 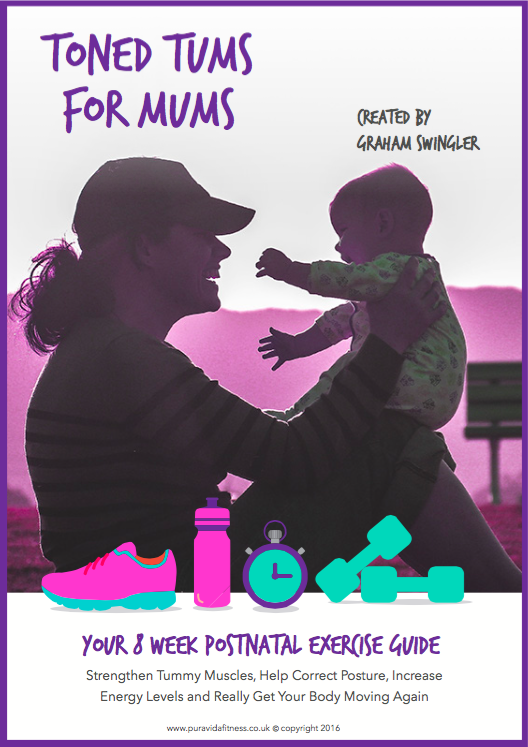 Time and time again we receive emails from new mums requesting help with getting back to their former fitness after the birth of their little one(s). Unfortunately, many of these requests are from mums that live all over the UK and abroad and are too far away to help personally. This inspired Graham to create a guide that’s easy to follow, employs minimal equipment and can be used almost anywhere. Most mums can start as soon as six weeks after giving birth. My Toned Tums for Mums Guide comes as a thirty four page downloadable PDF with easy to follow instructions and tips. If however you’d prefer one-to-one postnatal coaching, please contact us for more information.